Volume 4 of the ‘Advanced Tung Style Acupuncture Series’, is solely concerned with the application of Master Tung’s Acupuncture in the treatment of neurological and neuropsychiatric disorders. It is entitled ‘Advanced Tung Style Acupuncture’ because it, like previous volumes in the series, implies that the user has already had a course in Master Tung’s Acupuncture (e.g., that presented by Drs. Wei-Chieh Young, Min-Chuan Wang, Palden Carson, Robert Chu, Esther Su, Richard Tan, Miriam Lee, Susan Johnson, etc.). This text is not intended for use by the novice, but rather, as a reference by those who already have a working knowledge of Master Tung’s Acupuncture. The text presents 500+ pages of over 480+ prescriptions culled from the Chinese language Tung Acupuncture literature in the translator's personal library – more than 15 different sources were referenced (several currently out of print). He has compiled, collated, and translated all the neurological prescriptions proffered by the Chinese sources noted above, and applied accompanying diagrams for each clinical entity to facilitate their application. Included are: author-specific point locations, needling instructions, contraindications and, when available, clinical comments, lifestyle modifications, etc. 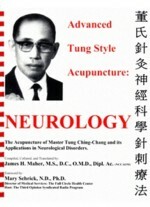 all derived from the author(s) own personal clinical experiences with Master Tung’s Acupuncture. Tung Style Acupuncture holds a preeminent position in the acupuncture circles of Taiwan, the Republic of China (R.O.C.). It is vastly different from the 'Traditional Chinese Medicine' (TCM) style of acupuncture that is currently practiced in the People's Republic of China (P.R.C.) and widely taught in the TCM medical colleges throughout the world. The Tung Style has been reported to predate the Huang Di Nei Jing and was first introduced into the English speaking acupuncture community in a 1973 translation of Master Tung's text by Palden (Wangden) Carson, M.D. The style was established in the United States by Miriam Lee, O.M.D., one of the premier acupuncturists in California who was instrumental in obtaining licensure and recognition for acupuncture in that state. Tung Style Acupuncture was brought to Taiwan from mainland China by Master Tung Ching-Chang in 1949 when he left China with the Kuomingtang (KMT) army under General Chiang Kai-Shek. His acupuncture style was thus spared from the synthesis of the 'New Medicine' engendered as a consequence of the 1958 dictum by P.R.C. Chairman Mao Ze-Dong to create a 'New Medicine', i.e. to unify the 'best' parts of Western and Chinese medicine. Ergo, the Tung Style escaped the efforts to compel acupuncture to conform to the model espoused by the TCM herbalists who had been assigned to the task of inventing this 'New Medicine' - forcing the proverbial 'square peg into a round hole'. As a system, Tung Style Acupuncture does not necessitate the use of the diagnostic methods or terminology adopted by contemporary, herbalist-driven, TCM acupuncture; this renders the Tung Style Acupuncture well suited for use by non-TCM trained clinicians. Furthermore, the clinical results obtained using the Tung Style Acupuncture often far surpass those achieved through the use of TCM acupuncture, especially in the West. This is, in part, because Western patients seldom conform to an exact mold of a single TCM pattern. Western patients typically present with a myriad of signs, symptoms, and western-biomedical diagnoses, which can often leave the TCM based clinician somewhat bewildered as to where to begin; this is particularly true in a multidisciplinary, referral based, setting. Tung Style Acupuncture uses points different from those found in most present-day TCM acupuncture texts. While many of the Tung points are found on the twelve regular channels, they are, however, in distinct locations from the 360+ points presented in the aforementioned TCM acupuncture texts. They are, also, largely distinct from the miscellaneous 'extra' or 'non-channel' points described in most contemporary TCM acupuncture texts. The Tung Style Acupuncture points chosen for the treatment of any given malady are located mostly on the extremities and at a distance from the site of the lesion or pathology. Furthermore, the number of points required to successfully ameliorate any given ailment is fewer than that required in most current TCM acupuncture texts to treat the same malady. Thus, Tung Style Acupuncture is a unique and highly effective form of authentic Chinese acupuncture. The style has been clinically proven very effective and is rapidly gaining in popularity all over the globe. This rise in global interest is due to its high degree of clinical efficacy and because the style is well suited to virtually all clinicians - those TCM trained as well as those who are not TCM trained. This text series should not be construed as introductory texts or as ‘primers’ in the acupuncture of Master Tung Ching-Chang, nor as preparatory texts on the TCM theories governing each specialty.